Hannah Hobson (20) blocks a shot by the Lake Superior State. 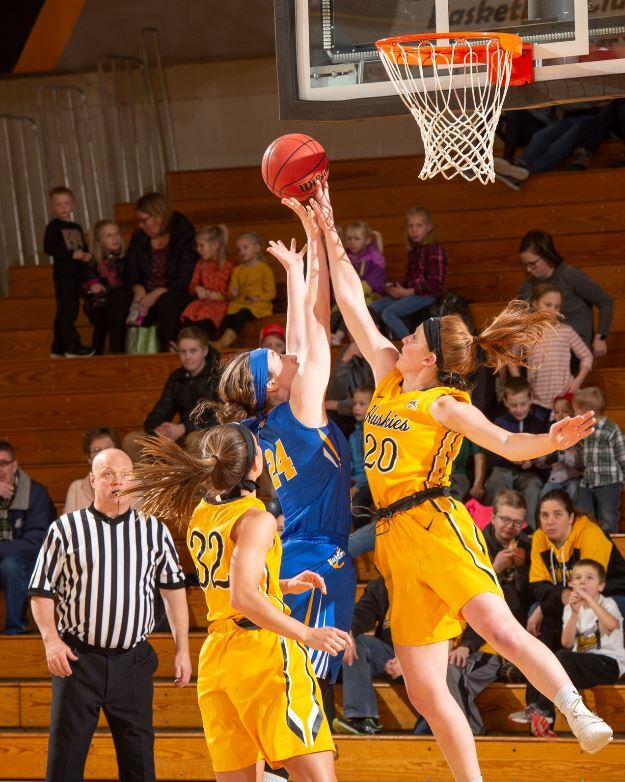 The Michigan Tech women’s basketball team won for the third consecutive time Saturday afternoon in the SDC Gym, topping Lake Superior State in a Great Lakes Intercollegiate Athletic Conference showdown 67-40. Five different players for the Huskies poured in 10 or more points, with nearly half of Saturday’s scoring coming in the paint. “These wins at home this week were huge for us,” Michigan Tech Head Coach Sam Hoyt said. “We started off a little slow shooting the ball today, but played well defensively throughout the 40 minutes. In the second half, our players stepped up and hit some big shots and our offense moved the ball well. Our balance on offense was outstanding again today and we have a lot of capable scorers who can produce points in different ways. It’s awesome to see different people step up game in and game out. It was also key for us to get some good post touches and easy baskets inside, because we are going to need that going forward to be successful. The Lakers remained within single digits until freshman Ellie Mackay found the target from long distance, boosting Tech’s cushion to 29-18 with 1:45 to go until intermission. Kohn answered the triple by Mackay on the Lakers ensuing possession, but Botz would bump the gap back to double digits again in the final minute, sending the Huskies into the locker room with a 31-21 lead. After Khon had cut Tech’s lead down to 39-28 on a pair of free throws, Botz grabbed an offensive rebound and got a putback layup to go to make it a 41-28 score with 5:26 remaining in the third. Mackay followed with a layup of her own, junior Hannah Hobson connected on a triple try, Kelliher added four points in the paint, and Mackay closed the string of 12 points in a row with a free throw conversion, resulting in a 51-28 Tech advantage. The Huskies never looked back from there and eventually created their largest lead of the night with 6:15 to play in the fourth quarter. Zenner did the honors when she buried a long-range jumper from behind the arc, extending the gap to 60-33. Freshman Clara Johnson closed out the afternoon by making a free throw which led to the final tally of 67-40. Botz and Kelliher paced the Huskies with 12 points followed by Mackay and Zenner who recorded 11 points apiece. Hobson rounded out the double-digit scorers with 10 points on Saturday afternoon. Botz nearly had her second consecutive double-double by pulling down a team-high nine rebounds. Mackay ended the contest with four assists, two steals, and three blocked shots. The Huskies found success on 28 of 56 shots from the field (50.0%), were 6 of 15 from three-point land (40.0%), and 5 for 9 at the free throw line (55.6%). Tech out-rebounded the Lakers 33-25, scored 32 points in the paint, and forced 18 turnovers which led to 17 points on the offensive end of the floor. Tech’s reserve players outscored the Lake Superior State bench 25-7. Khon guided the Lakers with 17 points while Claire Radtke chipped in three points and grabbed a team-high nine rebounds. Sadie DeWildt distributed three assists and had two steals. Lake Superior State made 12 of 41 shots from the floor (29.3%), dialed in 6 of 12 opportunities form a three-point range (50.0%), and were 10 of 11 at the charity stripe (90.9%).